Nicole's Needlework: Another Ornament Finished! I finished up another ornament for Myrtle Beach last night. I think it turned out so cute. I'm definitely going to have to make one for me. 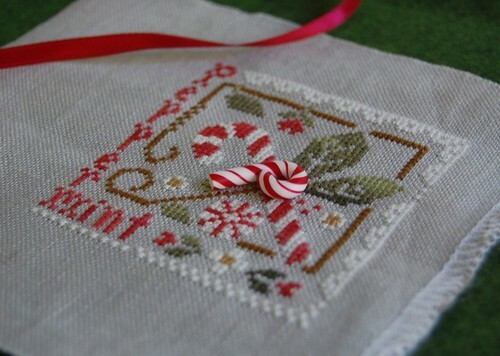 Little House Needleworks "Peppermint Twist"
Lovely finish Nicole, it's a sweet design! So cute, love this one! It's wonderful, Nicole! I bet you're looking forward to Myrtle Beach! I love your ornament Nicole. I can see why you would want to make one for yourself! I love this ornie - I have to get mine stitched! A lovely finish. Have a wonderful time at Myrtle. That is a cutie! I wonder if there is anything peppermint scented that you could put in the ornament?! But not hurt the fabric. That is a very cute ornament! I bet it will be a hit at the retreat! I hope to make it too some day. All of your ornaments are turning out so cute. Good job Nicole. I'm lovin' them!! I just love this one! Probably my favorite of the set. :) Question for you, how did you attach your peppermint button? The one that I got did not have any button holes to sew through. Did yours? Another very cute Christmas design! You most definitely need one for yourself! That is absolutely adorable. Bit of a shock to see you stitching such small projects, though! Another cute ornament and that candy cane really caps it off. Have a great time at Myrtle Beach! Can't wait to see your finish! I love this one! I have it in my stash to do . 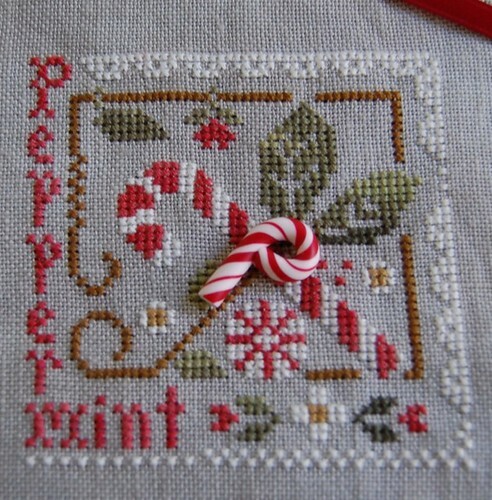 when I was in Michigan this summer I got some peppermint fabric to match for the backing at Joanne fabrics. I love this one. Saw it earlier somewhere and thought how beautiful it would be stitched. So cute and lovely, Nicole. That is sooo cute! I love the way the button mimics the design.